We golfers are usually urbane, sophisticated, and discerning fellows (and fellowettes, of course) who like nothing better than pairing a good golf trip with a visit to an acclaimed vineyard or three. The best golf/wine tours take travelers to Bordeaux in southwest France; Stellenbosch outside Cape Town in South Africa; Adelaide in South Australia; Tuscany and Campania in Italy; Catalonia in northern Spain; and northern California in the USA. An emerging destination for golf/wine aficionados whose courses don’t quite rate in the top 100 lists and whose grapes aren’t yet revered like those from the Loire, Napa, Mosel or Barossa valleys (just give them time) is Washington State in the USA’s Pacific Northwest. Here, the wine industry is relatively young – large-scale production of Rieslings and Chardonnays began in the 1970s - and ‘Wine Spectator’s 2012 world top 100 may have included only four Washington labels, but the Columbia and Yakima valleys are producing wines that are certainly getting the world’s attention – Quilceda Creek’s 2002/3/5/7 Cabernet Sauvignons each earned 100pts in ‘Wine Advocate’ while the 2004 and ‘06 vintages each earned 99pts – and there are a handful of golf courses that justify the world-class tag. One of the best golf/wine endpoints the Evergreen State has to offer is the historic town of Walla Walla which ‘USA Today’ named the friendliest small town in America in 2011. Walla Walla was long known for its sweet onions, but they have been superseded this century by grapes and the town’s rapidly growing wine industry which now accommodates over 100 wineries and 1,800 acres of grapes. The wine - Cabernet Sauvignon in particular – is generally so good it might actually be tempting to pass on the golf, but you can’t come this far without taking on the superb Dan Hixson designed Wine Valley GC which opened in 2009 seven miles west of town. A wonderfully natural course laid out over 235 acres of barren, often bleak terrain, Wine Valley is isolated and exposed and all the better for it. Not a single building clutters the magnificent view east, to the Blue Mountains, nor indeed to the north, south or west. 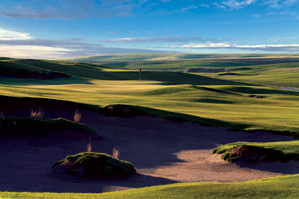 One hundred and twenty miles northeast of Walla Walla is the smallish college town (Washington State University) of Pullman and the WSU-owned Palouse Ridge GC, laid out by John Harbottle and opened in 2008. Like Wine Valley, Palouse Ridge benefits greatly from its out-of-the-way location and uncluttered design and, though there might not be much wine around here, the drive up is certainly worth the effort. You can certainly do the driving and make the tee time and winery tour arrangements yourself, but if it’s a knowledgeable, experienced tour guide you need, look no further than Charlie Thurston, a PGA professional from Spokane who offers custom golf and wine tours throughout Washington that include transportation, clinics before each round, and golf at many of Washington’s other great courses - Chambers Bay, Rope Rider and Prospector at Suncadia, Bear Mountain Ranch, Moses Pointe, Port Ludlow, and Gold Mountain, and even Circling Raven and the Coeur d’Alene Resort Course in Idaho. The beauty of choosing a firm like Thurston’s of course is not only does it take the often tedious job of scheduling everything off your hands, it also allows you to sample rather more Cabernet Sauvignon than you otherwise might.